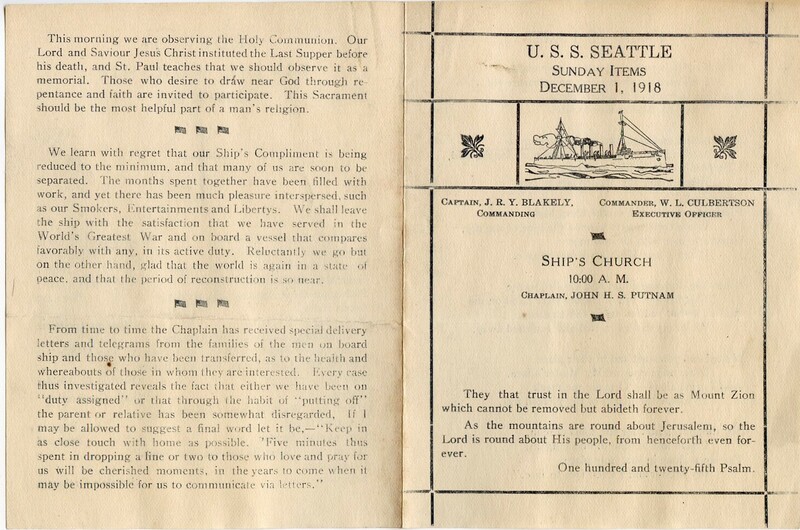 Worship bulletin from the USS Seattle, 1 December 1918 (author’s collection). 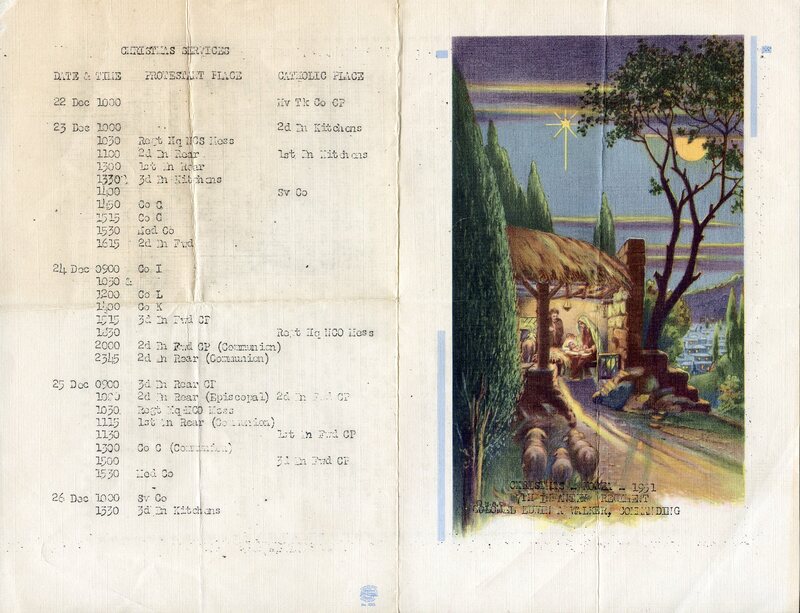 Inside of a worship bulletin from the USS Seattle, 1 December 1918 (author’s collection). Outside of bulletin for the Protestant worship service at the Post Chapel at Randolph Field, Chaplain Herbert A. Rinard, 8th Sunday after Trinity, between 1937 and 1940 (author’s collection). 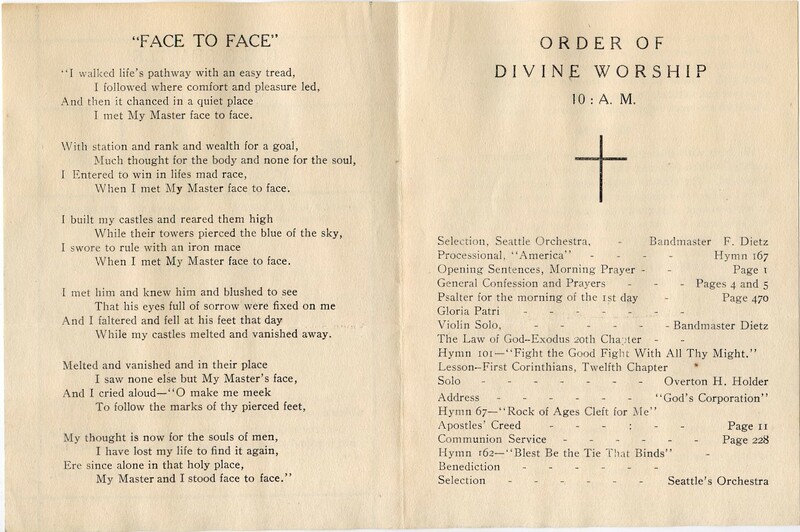 Inside of bulletin for the Protestant worship service at the Post Chapel at Randolph Field, Chaplain Herbert A. Rinard, 8th Sunday after Trinity, between 1937 and 1940 (author’s collection). 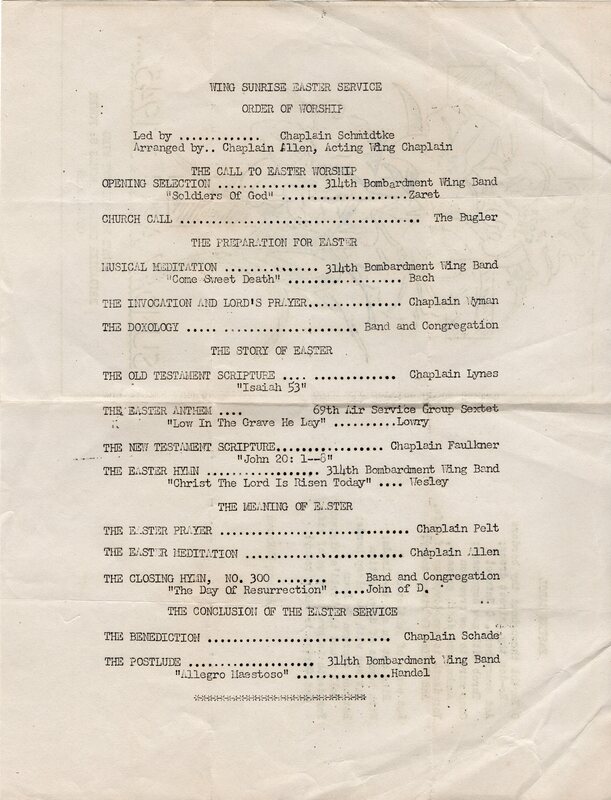 Good Friday program from 3 April 1942, Fort Leonard Wood, Missouri, for a service at the Chapel on the Hill, Twentieth (20th) Infantry. 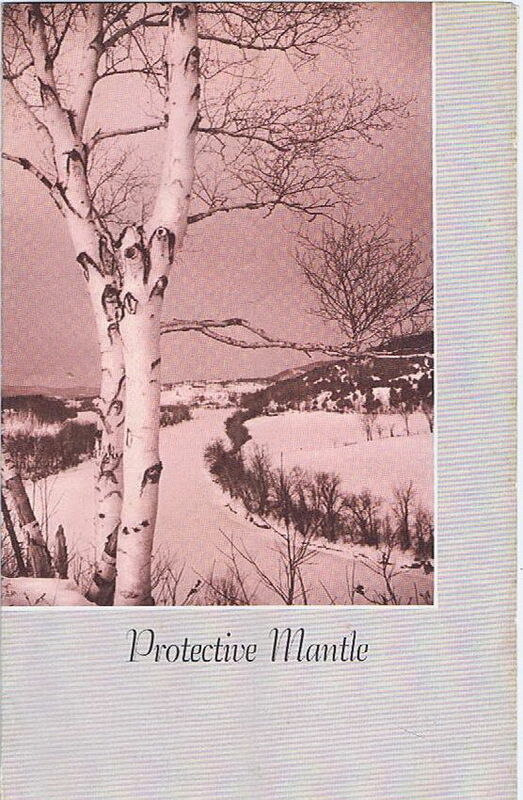 It was prepared by Chaplain Hayes H. Webster (author’s collection). Schedule of worship services for Jackson Army Air Base, Jackson, Mississippi, October 1942. The page includes George Washington’s order against profanity. Worship bulletin for Divine Services on the U.S.S. Essex, Chaplain A.J. McKelway, 1942-43 (author’s collection). 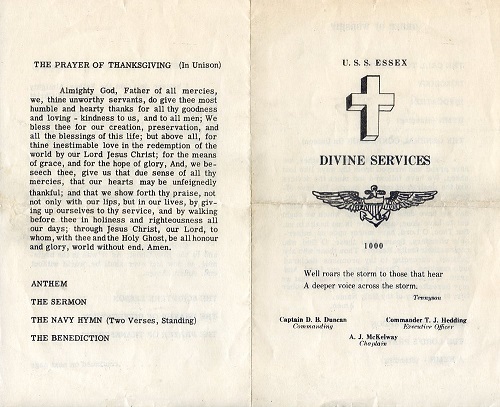 Inside of the Worship bulletin for Divine Services on the U.S.S. Essex, Chaplain A.J. McKelway, 1942-43 (author’s collection). 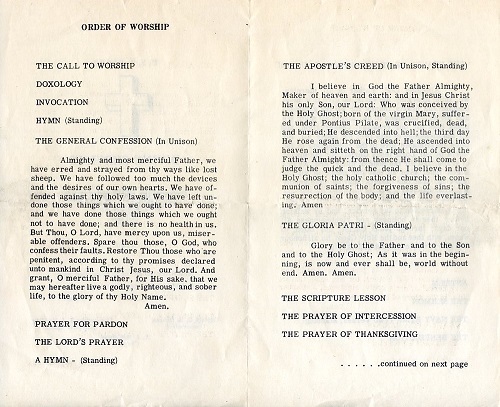 Order of Worship for Grosvenor Chapel during World War II, 23 January 1944. The service was sponsored by HQ. DET., SOS. 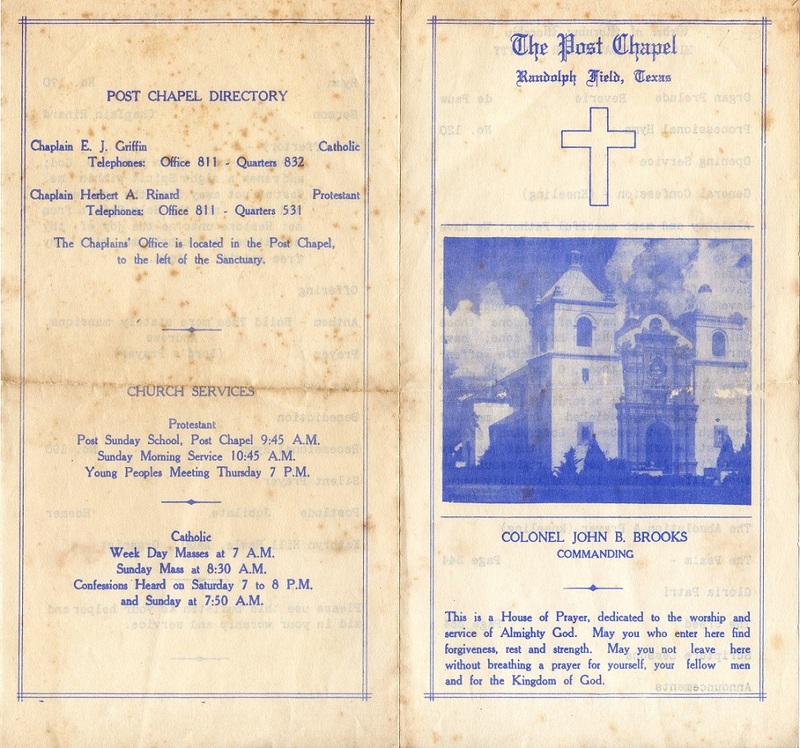 Bulletin for Protestant Service at the Fort Benning Post Chapel, 23 July 1944 (author’s collection). 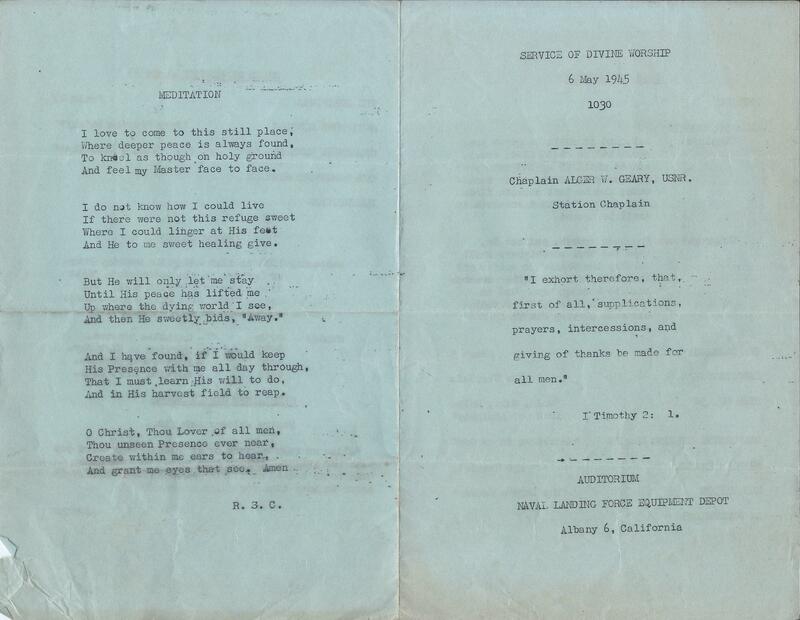 Order of worship for Protestant Service at the Fort Benning Post Chapel, 23 July 1944 (author’s collection). 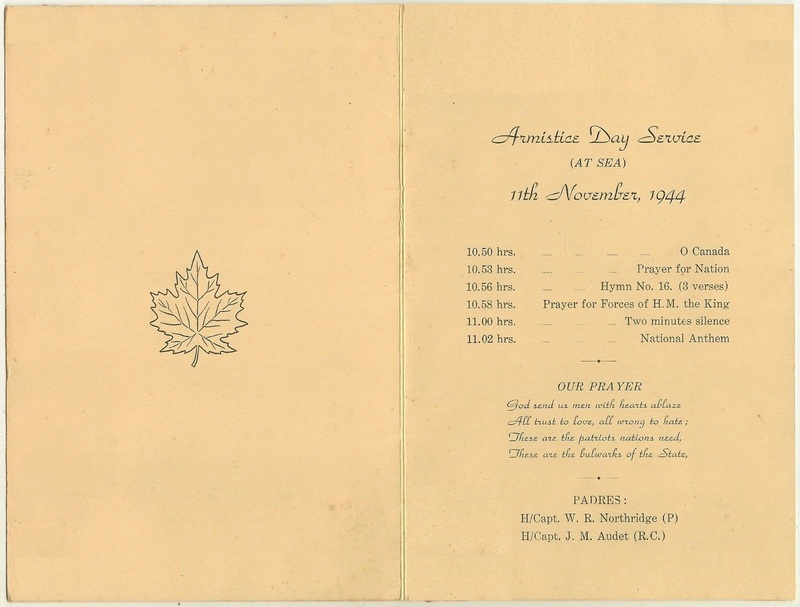 Armistice Day Service (at Sea), 11th November, 1944, No. 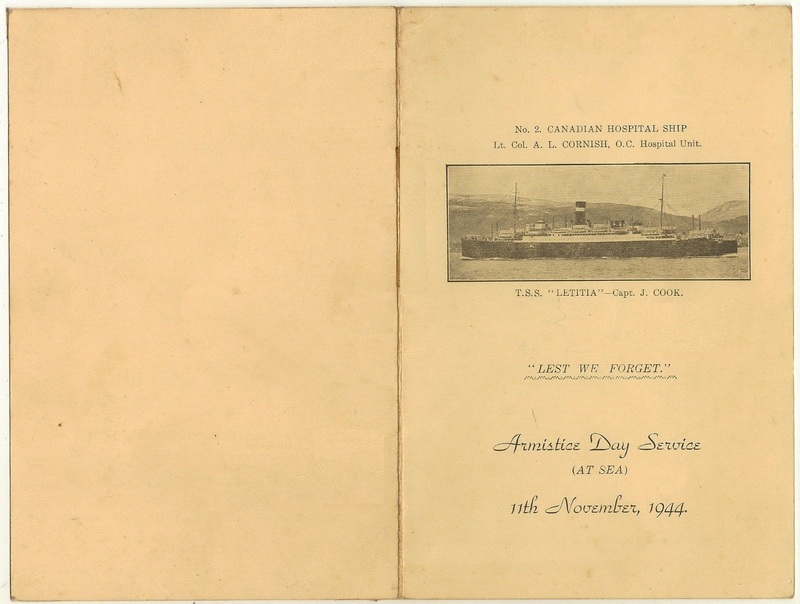 2 Canadian Hospital Ship. Allied Protestant Sunrise Easter Service, In front of the 17th General Hospital, Italy, 1 April 1945 (author’s collection). 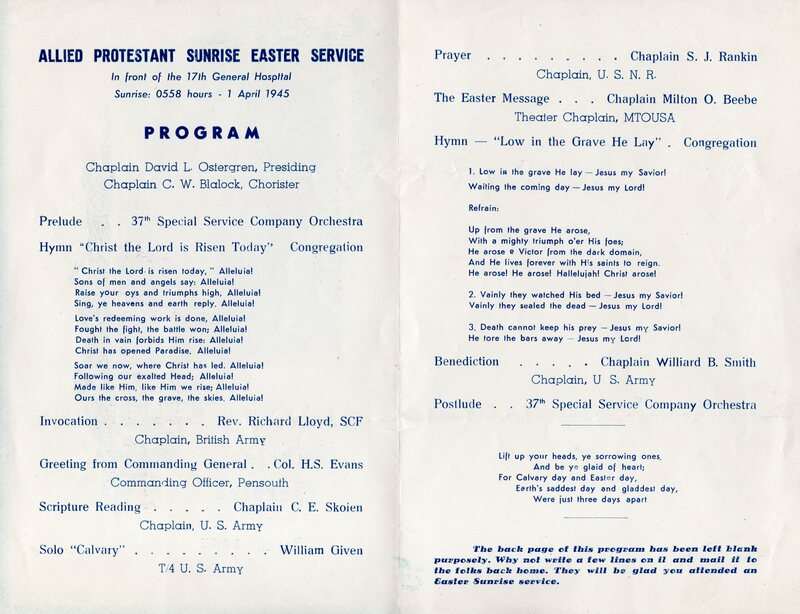 Cover of Easter Worship Service bulletin, 1 April 1945, 314th Bombardment Wing, Guam (author’s collection). 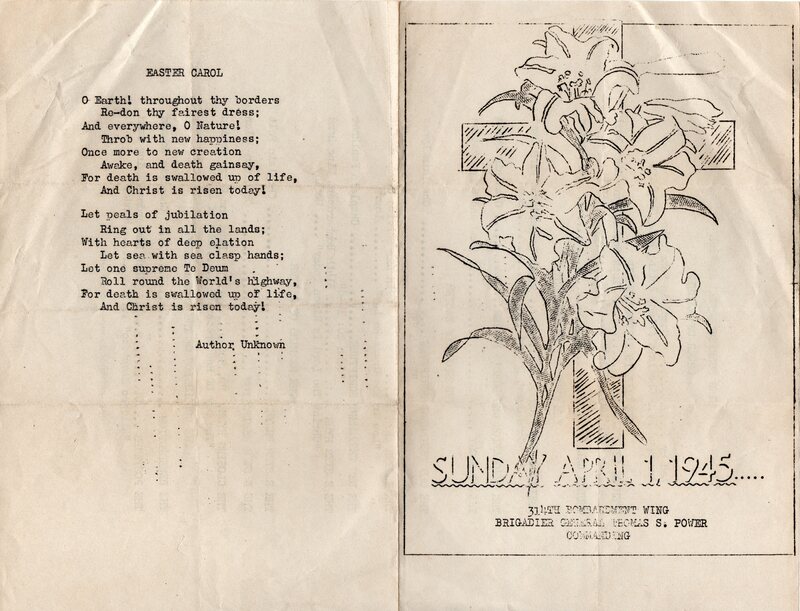 Inside of Easter Worship Service bulletin, 1 April 1945, 314th Bombardment Wing, Guam (author’s collection). Worship Bulletin for the Naval Landing Force Equipment Depot in Albany, CA for 6 May 1945. Alger W. Geary, USNR, Chaplain (author’s collection). Inside of Worship Bulletin for the Naval Landing Force Equipment Depot in Albany, CA for 6 May 1945. Alger W. Geary, USNR, Chaplain (author’s collection). 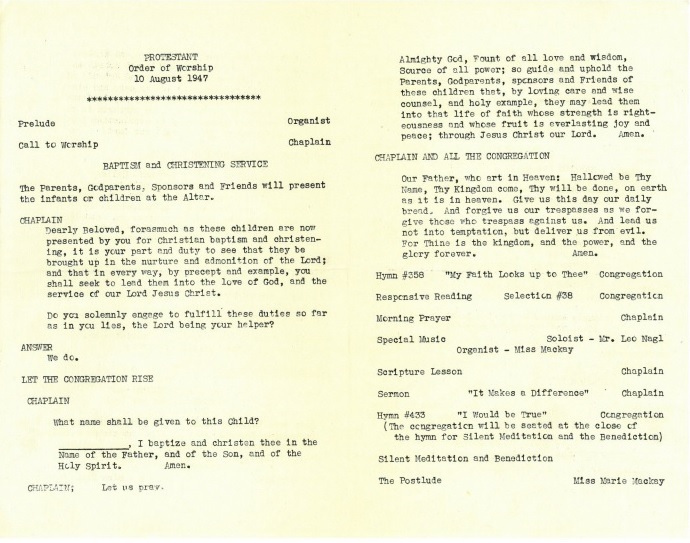 Worship bulletin for service held at Fort Belvoir, VA, 12 August 1945. Written on the top is “August 12, 1945 – Victory Church service.” This was about 3 months after VE Day and just 3 days before VJ Day. The week prior to this service, atomic bombs were dropped on Hiroshima and Nagasaki (author’s collection). Worship bulletin from Fort Belvoir, VA, 19 August 1945. Written at the top is “Ad day of thanks and prayer for peace in the making.” Four days before (15 Aug 45) the Japanese surrendered (author’s collection). 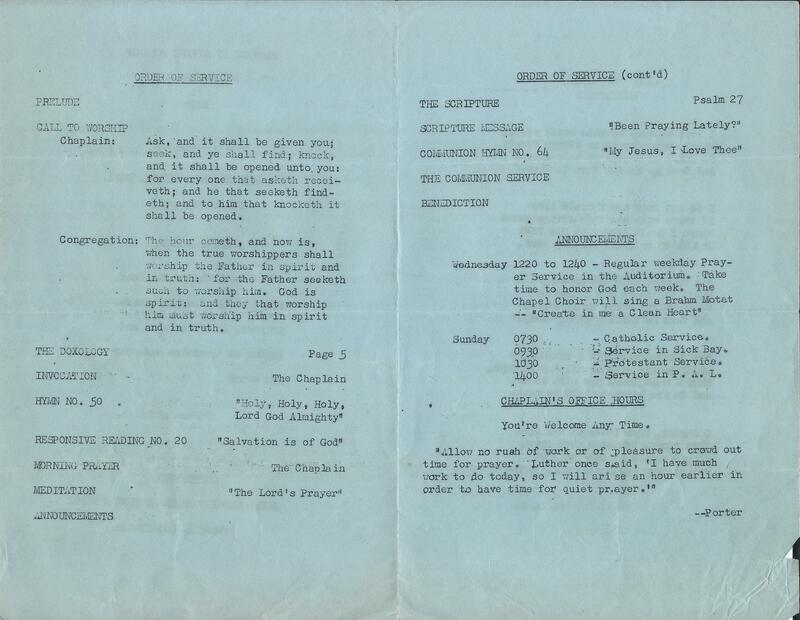 Worship bulletin from the First Replacement Battalion, Youngdungp’o, Korea, 5 May 1946 (author’s collection). 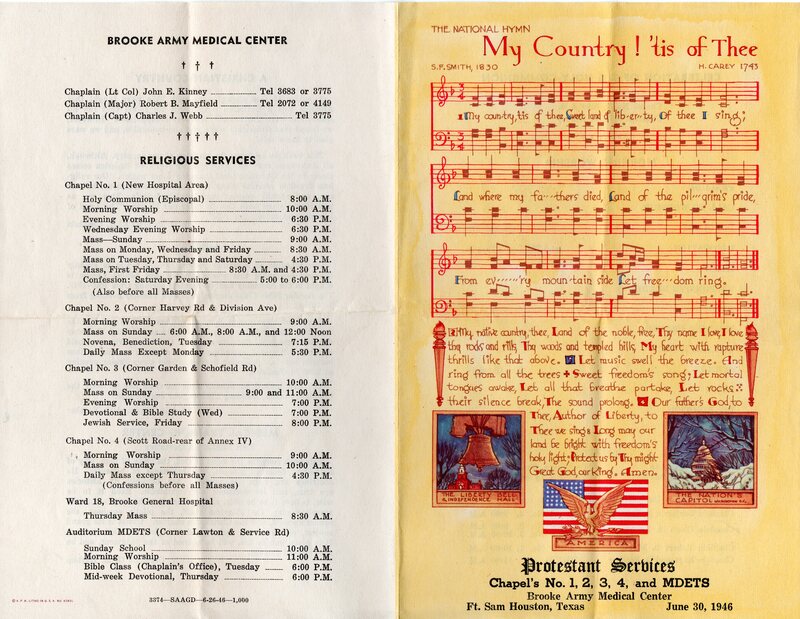 Protestant Worship Bulletin, Brooke Army Medical Center, 30 June 1946 (author’s collection). 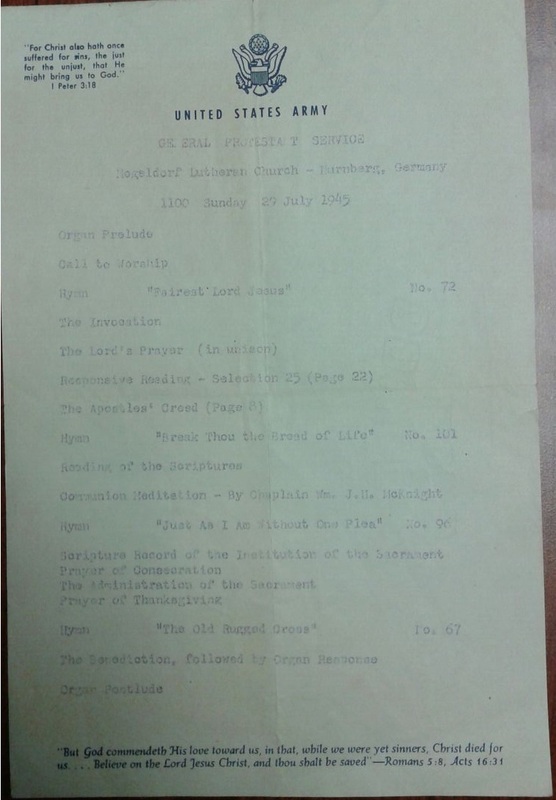 United States Army Protestant Worship Service Bulletin, St. Paul’s Evangelical Lutheran Church, Furth, Germany, 15 July 1945 (author’s collection). 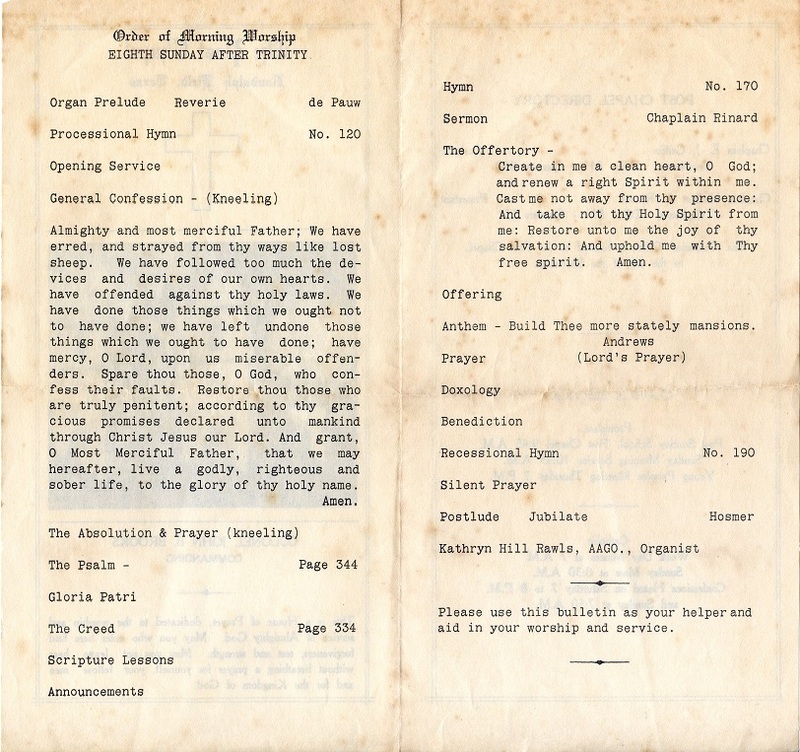 United States Army Protestant Worship Service Bulletin, St. Paul’s Evangelical Lutheran Church, Furth, Germany, 12 August 1945 (author’s collection). 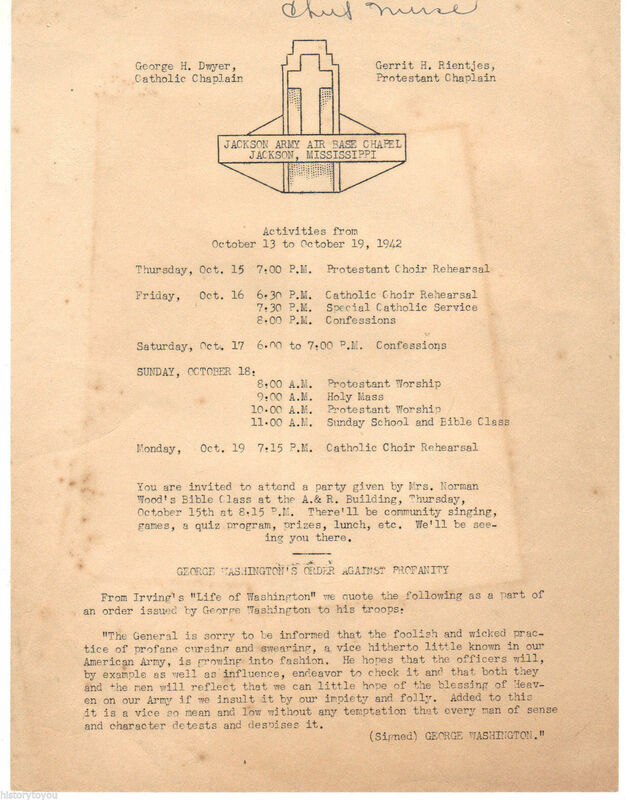 United States Army Protestant Worship Service Bulletin, St. Paul’s Evangelical Lutheran Church, Furth, Germany, 16 September 1945 (author’s collection). 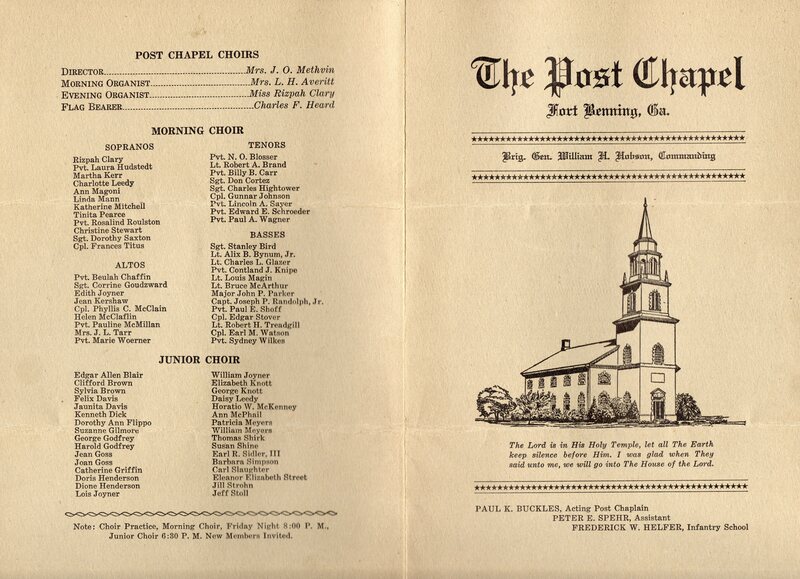 Cover of Worship Bulletin from the Post Chapel at Fort Hamilton, New York dated 10 August 1947. 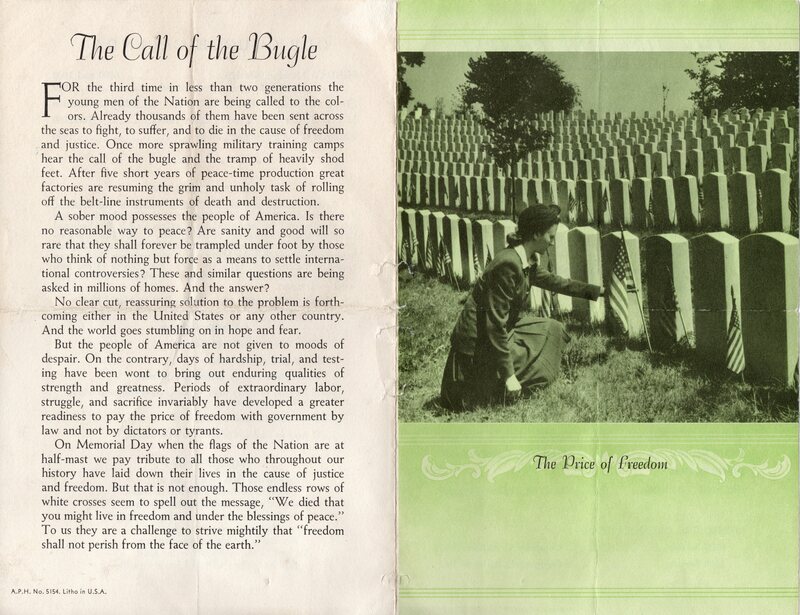 Found in a Bible belonging to Patricia Frasier, (courtesy of Chaplain (MAJ) Tracy Hudgins). 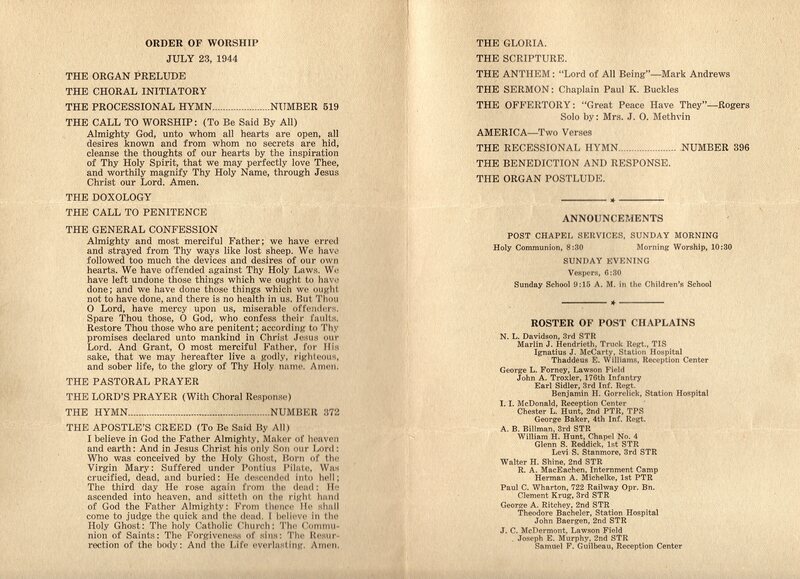 Inside of Worship Bulletin from the Post Chapel at Fort Hamilton, New York dated 10 August 1947. Found in a Bible belonging to Patricia Frasier, (courtesy of Chaplain (MAJ) Tracy Hudgins). Cover of Worship Bulletin from the Airborne Chapel, Fort Benning, Georgia, 27 May 1951 (author’s collection). 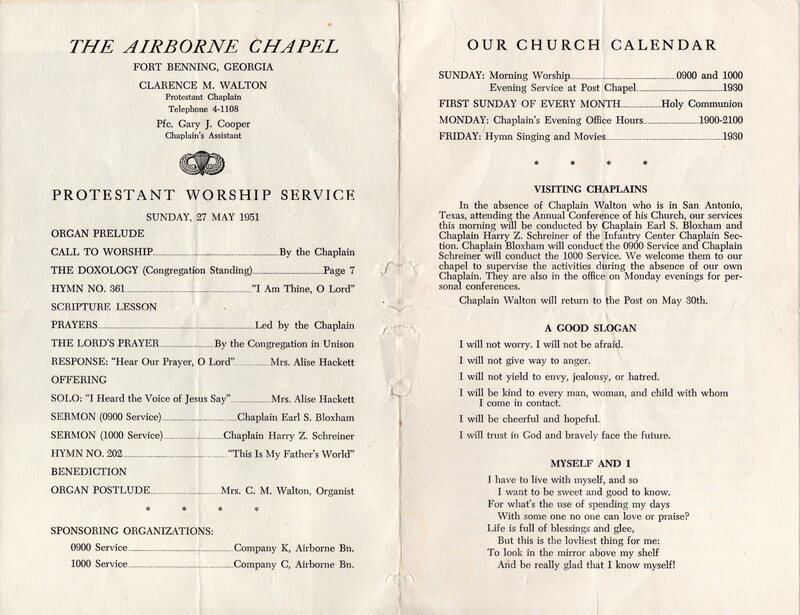 Inside of Worship Bulletin from the Airborne Chapel, Fort Benning, Georgia, 27 May 1951 (author’s collection). 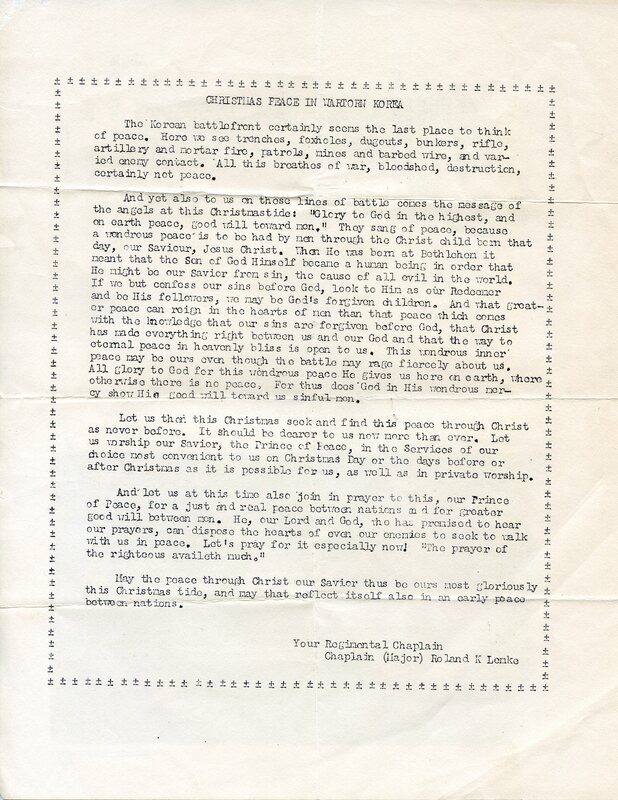 Worship Bulletin from the Christmas Day Service, 1951, 7th Infantry Regiment, Korea (author’s collection). 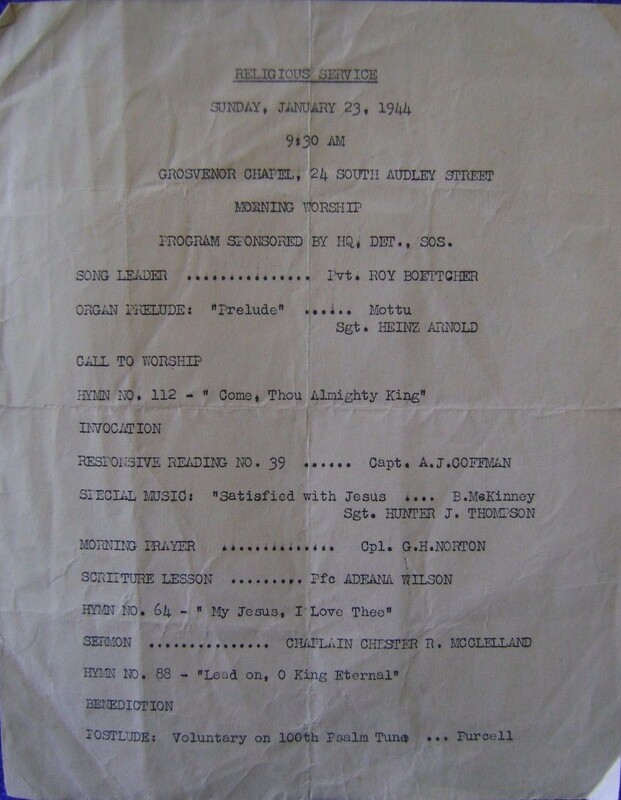 Inside of the Worship Bulletin from the Christmas Day Service, 1951, 7th Infantry Regiment, Korea (author’s collection). Cover of bulletin for Yokota Air Base (Japan) Catholic Service, 17 Feb 1952 (author’s collection). 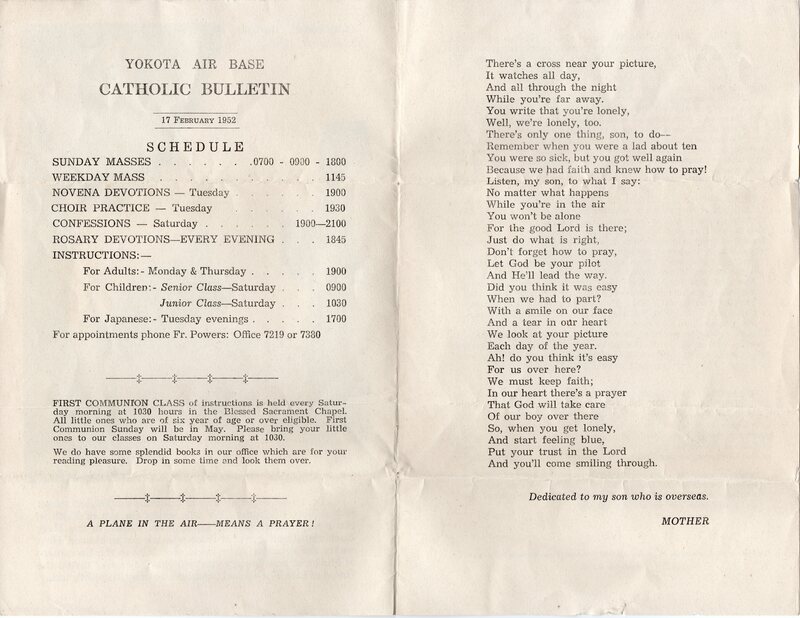 Inside of bulletin for Yokota Air Base (Japan) Catholic Service, 17 Feb 1952 (author’s collection). 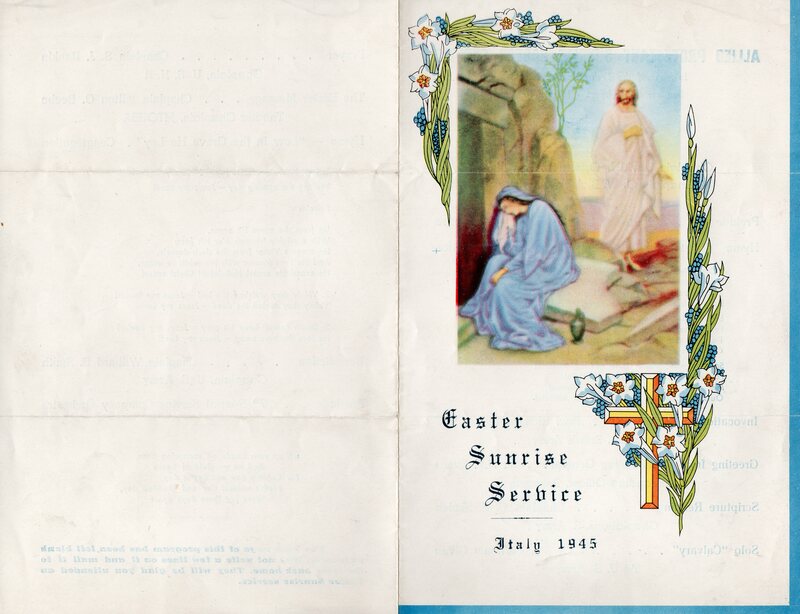 Bulletin from Easter Sunrise Service in Tokyo, Japan, 10 April 1955 (author’s collection). 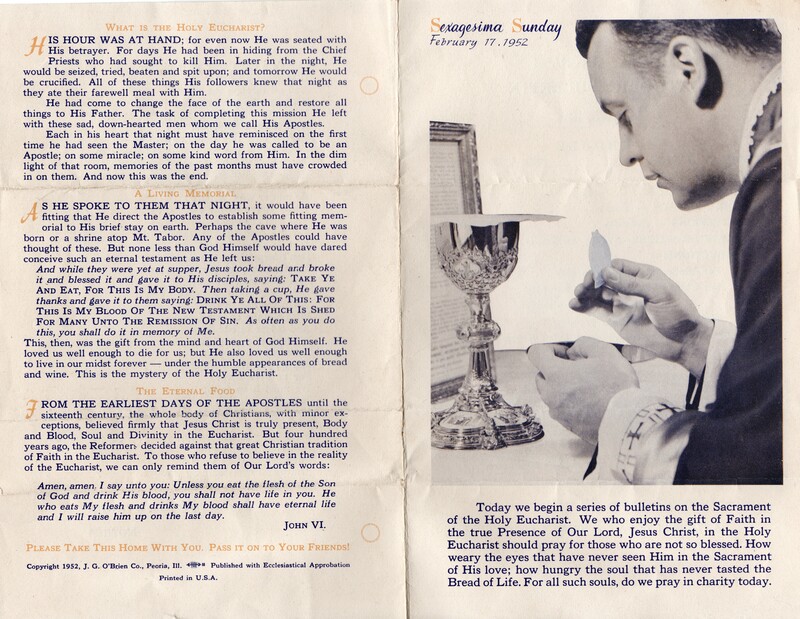 “Catholic Announcements” from Fort Leonard Wood, MO, 1 September 1957 (author’s collection). 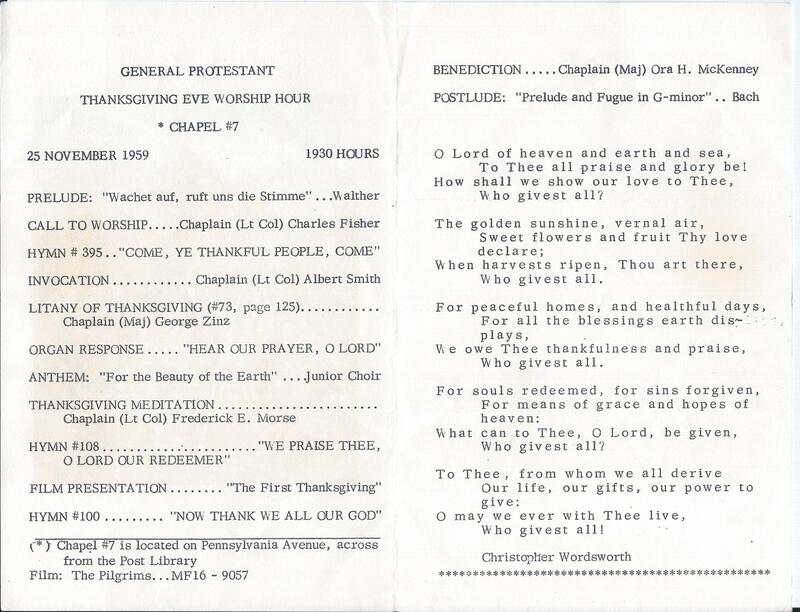 Worship bulletin for Thanksgiving Eve Worship Hour on 25 November 1959 in Chapel #7, Post unknown (author’s collection). 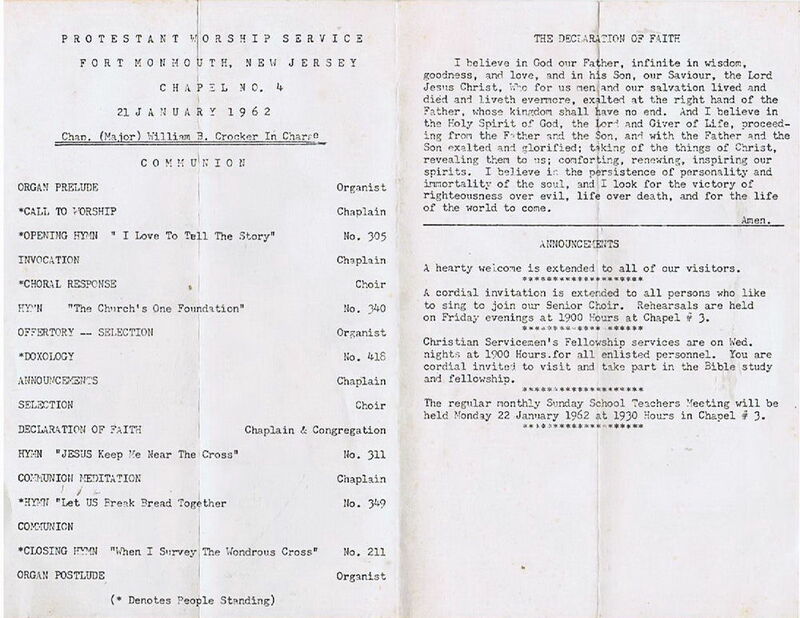 Front of Protestant Worship Service Bulletin, Fort Monmouth, NJ, 21 January 1962. 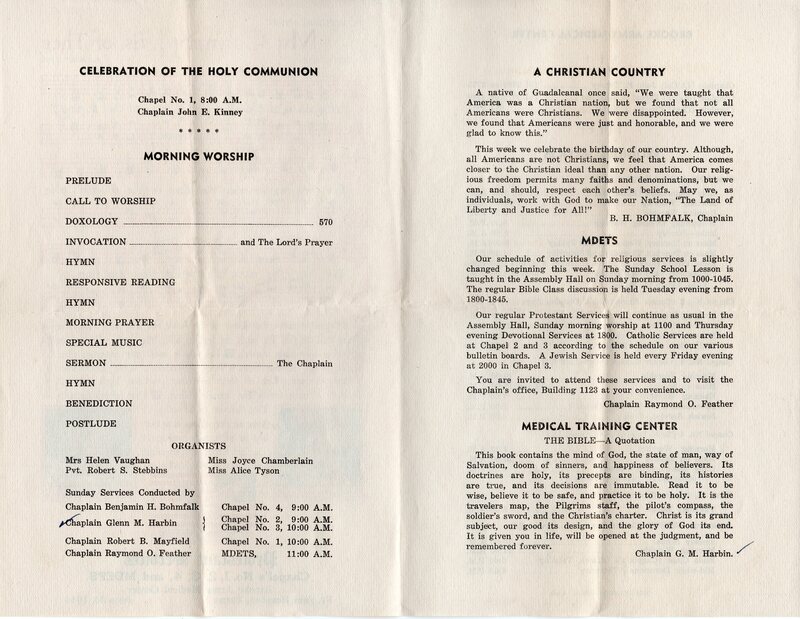 Inside of Protestant Worship Service Bulletin, Fort Monmouth, NJ, 21 January 1962.